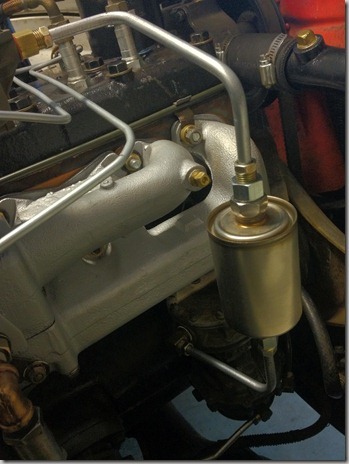 Many use a plastic inline fuel filter for the Dodge M37 Power Wagon between the fuel pump and carb to prevent debris from fouling the carb such as the one shown below. The clear design makes it easy to see if the filter is clogged however I didn’t like the unclean installation and wanted one that would connect directly to the fuel hard line. Searching around the internet I found this AC Delco GF652 Fuel Filter on Amazon for $9. After doing a little bending this is what I ended up with, I like the look much better.